Williams Roofing is staffed by a skilled and knowledgeable group of roofing specialists, highly experienced in the complexities of estimation and roof systems installation. 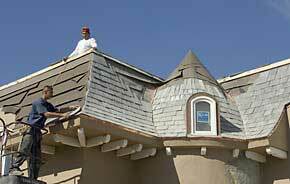 We are also prepared to go the extra mile for all of your roofing needs to assure you are 100% satisfied. Every roof is distinct -- each with its own set of characteristics. Our estimating team will discuss your options for selecting the best type of roof coverage for your home. We are approved installers of every type of roofing system and are known in the industry for uncompromising commitment to using the highest quality products, maintaining exceptionally high design and installation standards. We are pleased to bring the samples to you or provide addresses of homes we've done with the materials you are considering. We know the importance of matching the roof color with the exterior of your home. Therefore, it is imperative to put the sample boards or full shingles, if you wish, next to the brick or siding of your residence in order to ensure a complete match. Williams Roofing will be there the next time you or your neighbors need us and will operate with integrity and guarantee your satisfaction. We will do our best to provide you with the highest quality roofing systems that meet your personal or business requirements. We are pleased to give you roofing with a personal touch. Our highly-trained staff is constantly checking the jobs during installation, to ensure that everything is being done to the highest degree of quality service possible. Williams Roofing delivers quality service based on our simple but enduring philosophy of always putting our customers first. We carry extensive insurance coverage to protect you and your home or office building. Our qualified project managers will monitor the project, ensuring that your roof is finished on schedule, within budget and to your satisfaction.